Of course, there are loads of things I would like to make. I think some more sporty things may be up first. And maybe a pair of denim culottes/three quarter length trousers. 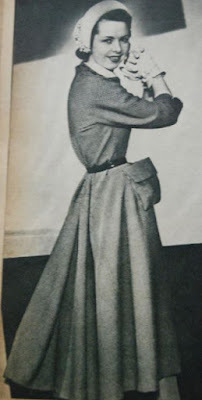 I still have more Vintage Sewing Pattern Pledge related plans too, 1970's certainly and maybe something from between 1940 and 1947 or another go at 1920's... And practical needs may show themselves over the course of the season and they will have to be dealt with too. This is the amazing suit I almost started on in spring. Back then, I realized that my spring-suit-appropriate fabric wouldn't work for a design like this and I made this suit instead. It was the right decision but I still want this one too. And I have a fabric in stash which might be suitable (although I worry about the bulk and weight of that drape). Made from jersey (the original inspiration suit as well as the version I'm planning) it should be easier to wear than your average 1950's suit. 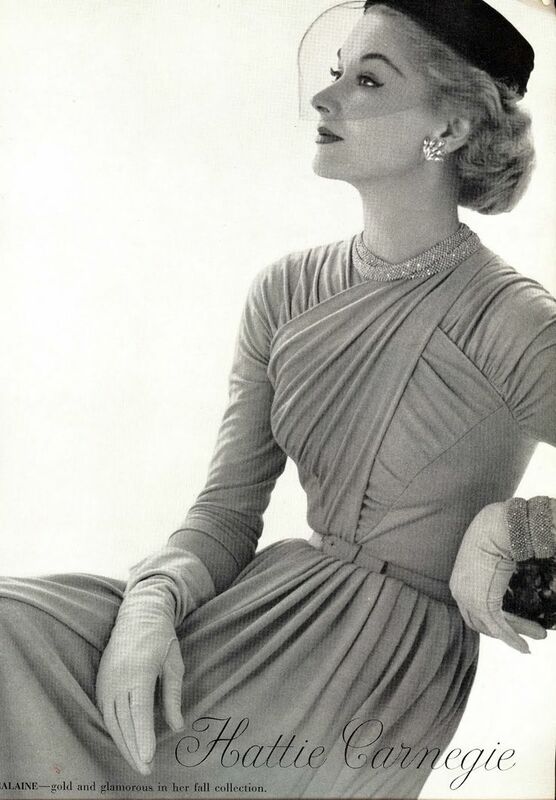 It was one of the inspirations for my flounce dress but, in the end, not the main one. The disadvantage of this design (by Nina Ricci) is simple: There is no way I can get a similar look and secretly introduce more room for movement in that narrow skirt. The fabric I have in mind for this one is a cotton flannel in a small blue and grey houndstooth. It's a direct relative of that white-on-black check I used for the flounce dress so I know this stuff will be good to sew with and wear and wash well. Because of its disadvantages (and also because I already have a flounce dress), I also have another candidate for that fabric. This dress. Nice skirt with width at the back, interesting sleeves integrated with with the yoke and that pocket might work... A bit more normal maybe but also more practical and it looks like it was made from a fabric like this in the first place. And I have already drafted that bodice (as one of the options for my black wool crepe. It seemed to casual/sporty for that fabric but would work well for the flannel). Oh, and this picture comes from a different magazine, from just over a year later. Could this possibly be the front of the same dress? And there's this dress. Lots of pockets and kind of ugly and glorious at the same time. I'm thinking about making it in brown corduroy. And I have been talking about gather a lot but I have really sewn a lot of gathered designs. This is a fairly recent pin and not one which comes from a vintage magazine I own. It is fabulous and I could make it, draping jersey over a smooth fitted under-layer. Although I would probably need that girdle/lingerie corset to get such a great silhouette. I have a fabric which would be great for a dress like this but I'm not so sure I have enough of it. I also feel I should definitely sew up the wonderful tartan I bought last year in Scotland. It was expensive so I didn't buy much but it should be enough for a sleek and simple dress. Something a bit like this. Some of these dresses (and suit) will certainly 'come to life' this coming autumn and winter but it is more than likely that many will stay on my long, long to-sew list for just a bit longer... So many ideas, so little time and closet-space. best of luck with the sewing plans, I adore that plaid/tartan pic, fabulous. All these looks are so lovely and inspiring! 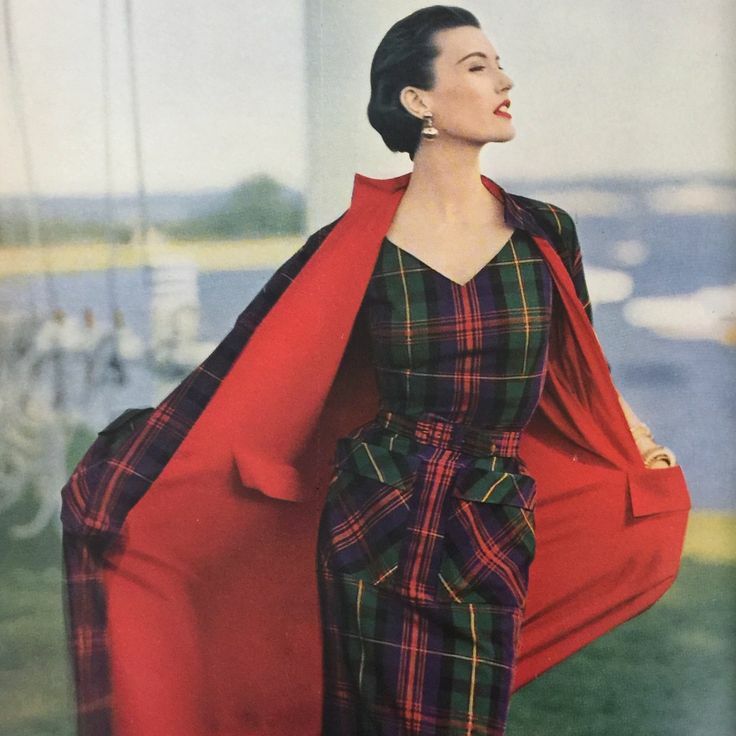 I think the tartan dress would be especially lovely.